Standard product and color plated product should be lubricated as needed. 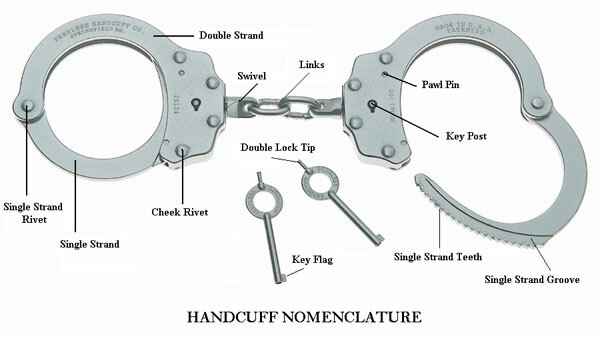 The frequency will depend on how the cuffs are stored, how often they are used and the environment they are used in. It is best to use a high quality light weight lubricant. Heavy or greasy oils will clog the lock mechanism and attract dirt or other debris. Pentrate (black oxide) finishes may require more frequent lubrication and may tend to rust if not kept properly oiled. Drip or spray the oil in small amounts to the areas shown below. Use as little oil as necessary. Work the oil into these important areas by ratcheting the single strand, locking, double locking and unlocking the cuff. After lubrication remove all excess oil from handling surfaces so the restraints are not slippery. Ultrasonic cleaning is another option. Many large agencies or departments have ultrasonic cleaning tanks for firearms maintenance. The same process can be used for cleaning and disinfecting our standard product. Do not use ultrasonic cleaning methods with Peerless high security restraints and color plated restraints. Another option is to use a bleach bath. Mix 1 part bleach to 10 parts water. Soak the cuffs for 10 min. and then following the instructions below. The bleach may cause the nickel finish to cloud or tarnish. Do not use this method for product with black oxide finish, color plated finish or our high security restraints. Use the following to disinfect Peerless color plated prodct and high security restraints. Important - High Security Restraints: Care should be taken when using cleaning solvents and lubricants on high security restraints. Different chemicals, temperatures and stress can have adverse affects on the LEXAN® thermoplastic lock housing. Cleaning Color Plated and High Security Restraints: Clean with mild soap and warm water only! Hot water above 140ºF should be not be used. Care should be taken to remove all remaining cleaning agents with forced-air drying or warm water. For high security restraints complete immersion is not recommended and should be avoided. After disinfecting the restraint should be lubricated. See maintainance for more proper lubrication information.